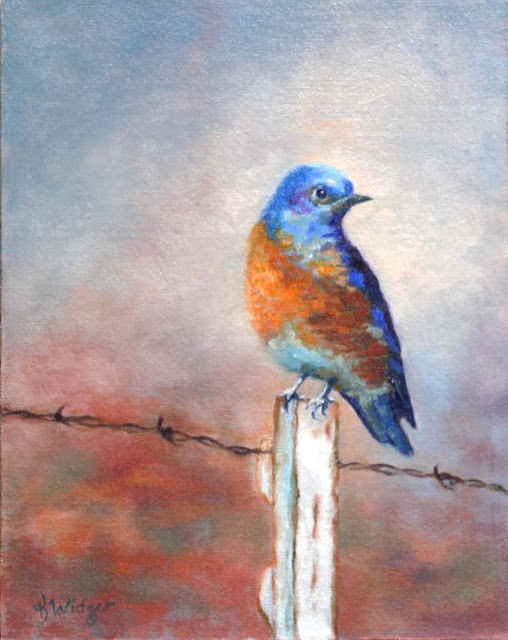 Late spring in Edgewood, a male Western Bluebird sits on a metal post not far from the nest box, watching over his growing family of nestlings. He faithfully catches insects and deposits them in the waiting beaks of his little children, and takes turns with his mate as she takes time out of the nest box to feed herself. He is so faithful and dedicated to his family and an inspiration to fathers everywhere! Finished! Signed and photographed, framed and ready for entry into next juried show! Will also be showing this at The Watermelon Gallery in Cedar Crest, NM. Really enjoyed painting this one. 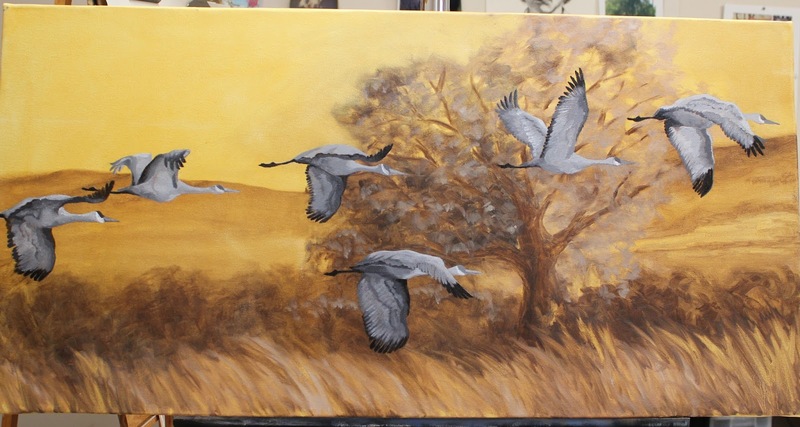 It was a challenge, but I'm very pleased with the way it turned out, especially the cranes. 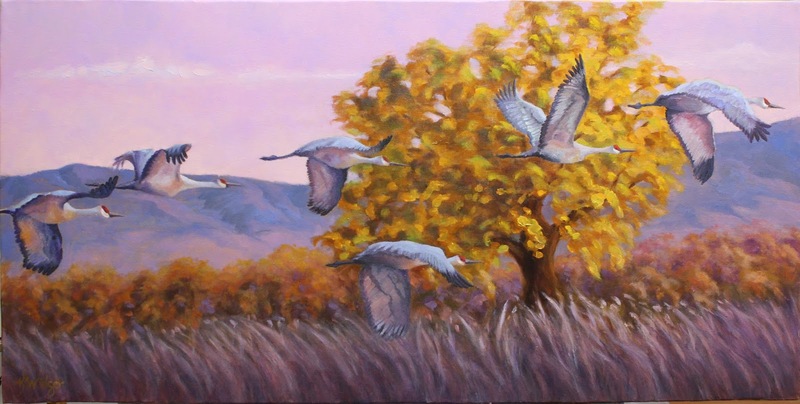 Strived to get the anatomy correct and their flying formation accurate, as the cranes lift off from their watery refuge at the Bosque del Apache Wildlife Refuge in Socorro, NM. Morning breaks with first light of the sun, that soft rosy glow that eases over the eastern horizon, then sparkles with the dew, like opalescent rainbows on the new day! Original reference, cropped and "photoshopped", sized for an 18" x 36" canvas. 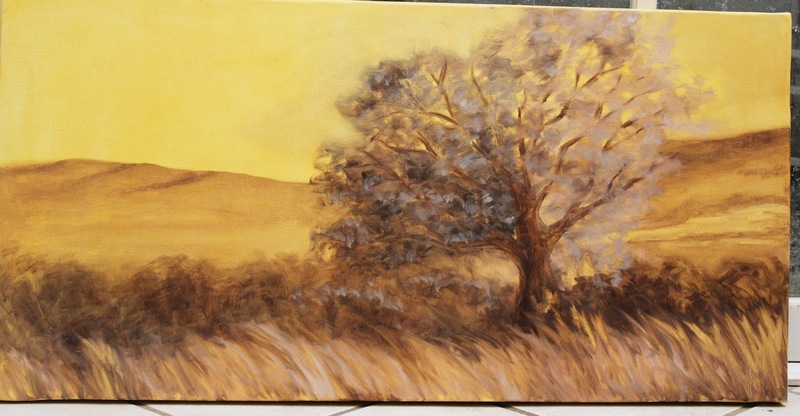 Underpainting done on canvas toned with yellow ochre. 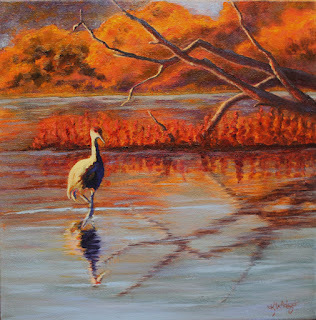 I painted with burnt sienna and ultramarine. 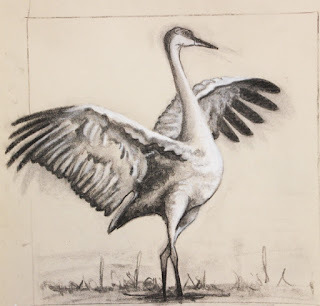 Charcoal drawing of cranes, "to size", about 6" each, trying to capture each wing attitude. I painted in the cranes using values of Ivory Black in 7 steps. Now I will start on the "second statement" using local color. I will follow as closely as possible the values I have set out in this underpainting. Inspired by nature, events, locations, experiences, feelings, music, lyrics, photographs, the idea begins to take on a life of its own. Sometimes they compost for quite some time until they begin to take physical form. Sometimes they just present themselves to you in whole cloth, waiting for paint to transform them into two-dimensional images on canvas. Inspiration! How exciting and energizing! Artists live for it! It is the life blood that motivates us to spend countless hours developing our craft and skills, to earn paltry sums for our talents, and to not care, if only we can paint what our heart sees, and make you see it, too! 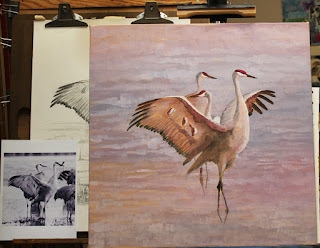 Here's a few pictures of the "beginning" of a painting, as yet far from finished. 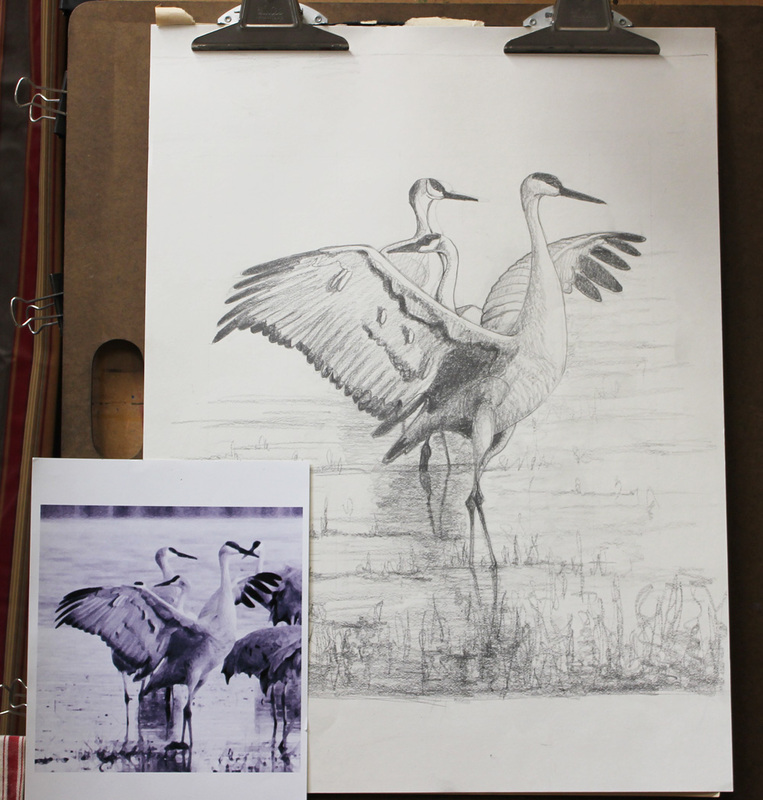 Here's what goes into making a painting, and how "long it takes." Original sketch of "inspiration": standing crane, charcoal and white conte on newsprint. 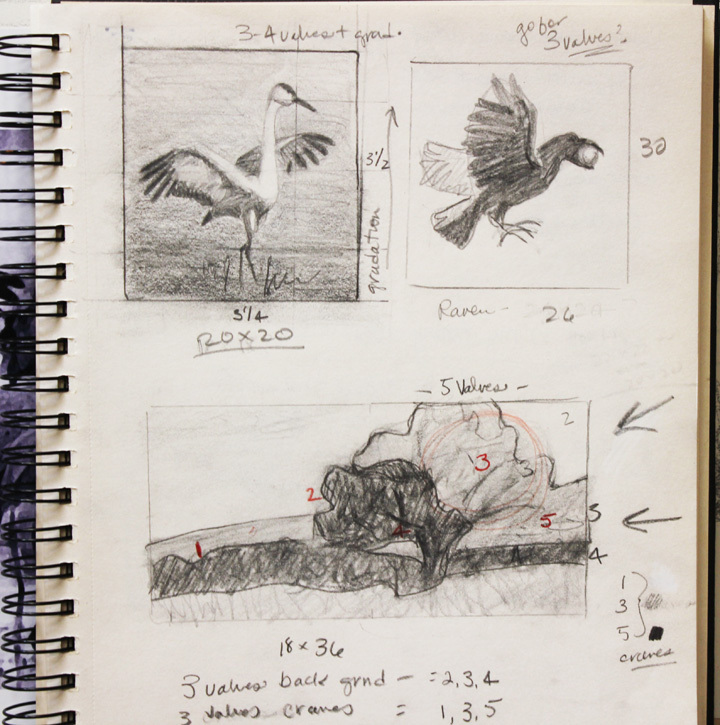 Thumbnail sketches from sketchbook, working out design idea on various planned paintings. Finished, working drawing "to size" for planned painting "Morning Praise" along with reference photo. First "statement", a rough "underpainting" showing value and temperature. It's been a long while since I've posted. Illness robbed my energy and kept me out of the studio for many months last year, and posting to my blog slid down the list of importance. Overcoming the little and not-so-little adversities in life takes perseverance and patience, I've found. 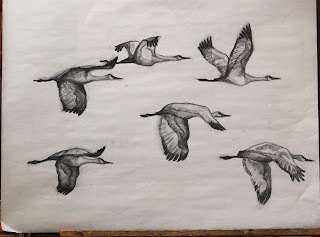 I'm back in my studio now, painting, drawing, sketching. 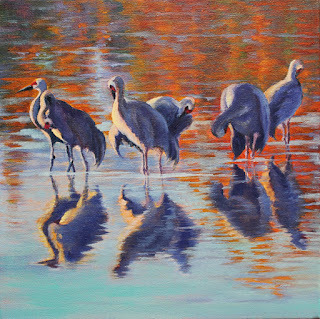 Renewed vitality, interest and energy has me at my easel looking closely at birds, again. Incredible creatures with above-average intelligence, they inspire me with their beauty and abilities we somehow overlook or fail to notice. 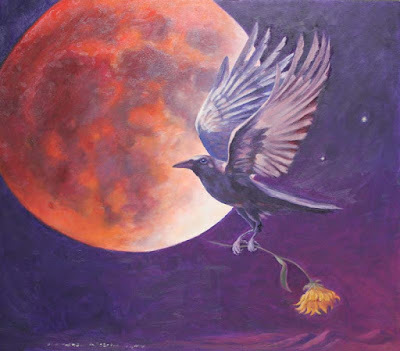 Ravens, especially, the smartest of all flying creatures, those wolves of the air, inspire me to paint their individual characters. We have two ravens who live in our area, or, rather, we live in theirs. My husband has lately taken to befriending them with eggs and other offerings, placed on a nearby post, in order to tease them into letting him take pictures of them. It's sort of a trade; we give them treats, they let us take their picture. They always take the goodies, and sometimes even caw their "thanks". But only occasionally do they let us take their picture. They seem to "know" the camera is there, even hidden in a blind, even set on "automatic" with no human present. They have incredible eyesight. Bernd Heinrich says they can see for a distance of two miles, accurately! 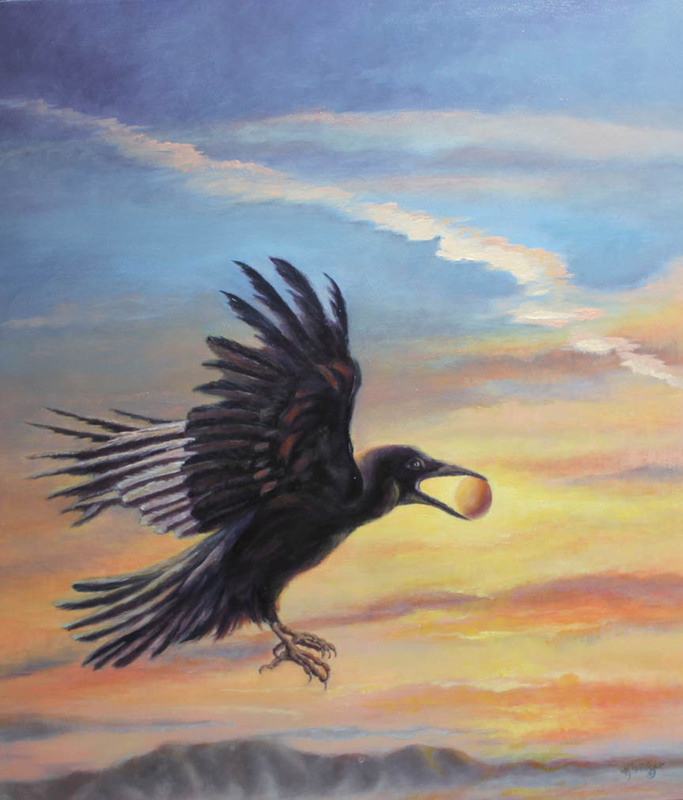 Hard for some to believe, but they also seem to possess a "second sight"of sorts, a telepathy that Rupert Sheldrake describes in his many intriguing books like "Dogs Who Know When Their Owners are Coming Home", and "The Sense of Being Stared At" along with "The New Science of Life" that corresponds with his theory of morphic resonance. Fascinating stuff! And makes perfect sense to those of us who know that life is more than the material. 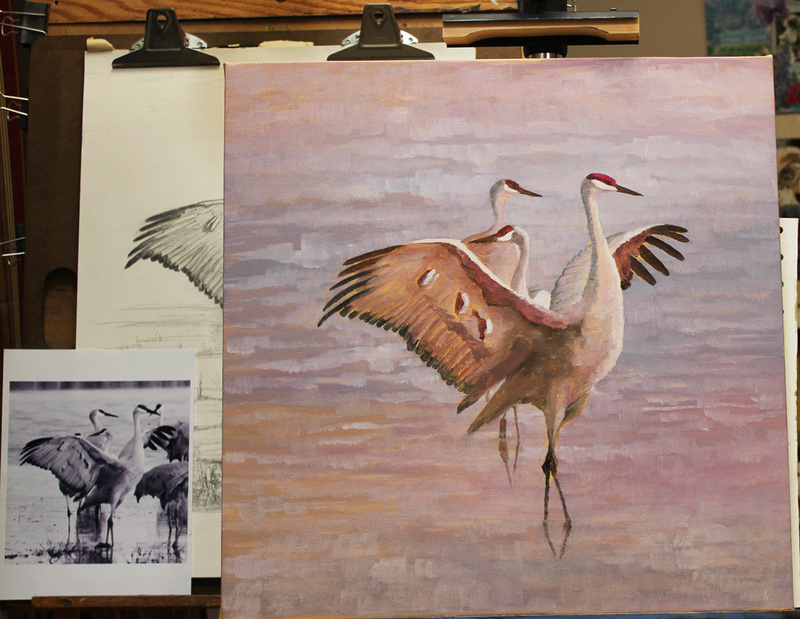 I'm also painting cranes. 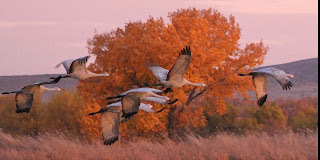 Sandhill cranes who winter at the Bosque del Apache Wildlife Refuge in Socorro, NM have been the focus of our many trips down there in the fall. 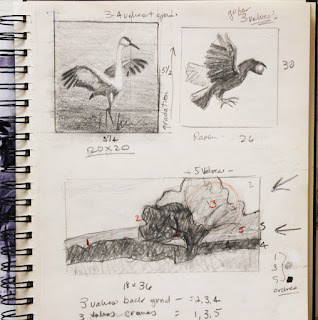 I'm developing two paintings right now, and I'll post the sketches, preliminary drawings and underpaintings that I've done so far, so you can see what actually goes into producing an oil painting (in part, to answer the oft asked question, "How long did it take you to paint that?"). 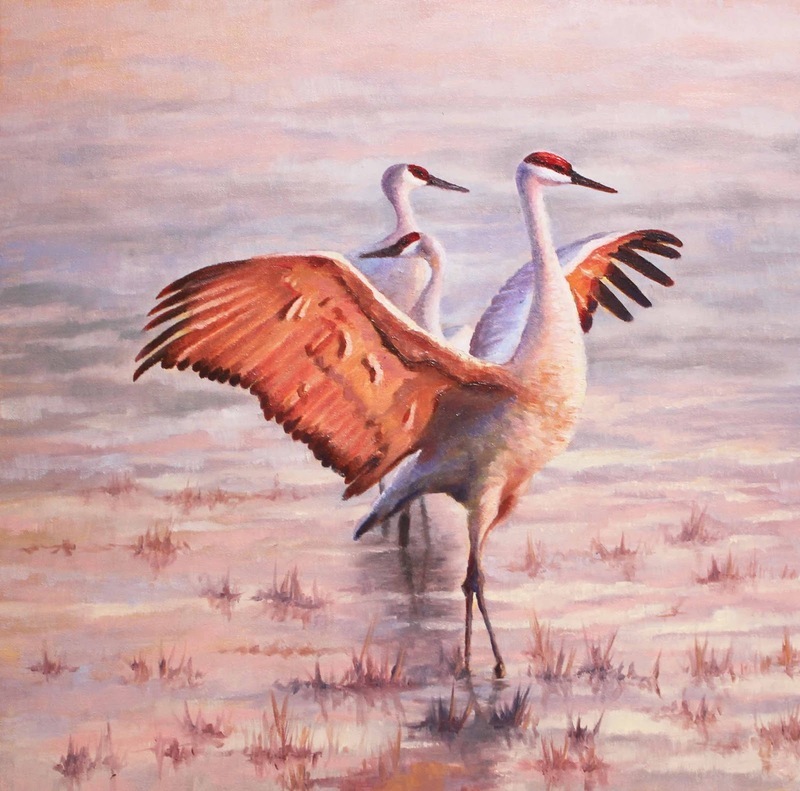 And I just this day received notice that two of my crane paintings were accepted into the national juried show, "Encantada", sponsored by the Rio Grande Art Association. It will be July 10-26 at the Fine Arts Bldg at the EXPO New Mexico in Albuquerque.